« Did you miss Mikunopolis? We’ve got you covered! “Those who can, do. Those who can’t, teach.” Or so the old saying goes. And if the act of “teaching” includes blogging and podcasting, then it’s especially true in my case. You see, I can’t draw worth a darn. And that explains why I write about anime and manga rather than actually create it. 😉 But, as is true for many people I’m sure, there are still stories bouncing around in my head that I wish I could either animate or draw. (Or maybe I just want to make a cheap rip-off or parody of some already existing property.) 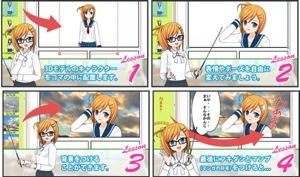 Luckily, for people like us, technology is here to help, at least as far as “drawing” manga is concerned, thanks to a new program called ComiPo!. You’ll need to enable Japanese language support in Windows. I previously showed you how to do this in my Kanon installation video, but it turns out the steps I showed there were incomplete. I’ve made a new video that shows you how to properly enable Japanese language support. Unfortunately the software is in Japanese (duh) and no English translation (or tutorial) has yet been put forth; I’m sure that there are groups working on this Newsflash! The creators of ComiPo! have announced that they are working on an English language version of the software!! For now you’ll have to resort to the tried-and-true technique of “click on something and see what it does.” You also might want to check out the official demo video to get an idea of what you can do with the software, as well as episode 8 of Patrick Macias’ and Yuu Asakawa’s (English language) show Otaku-verse Zero, who also showed off ComiPo! ; the segment starts in at around 03:00. Japanese culture blogger Danny Choo also wrote about it and you might find some useful tidbits in his post (as well as in the comments to his post). He also featured ComiPo! in episode 11 of his show Culture Japan. (The segment starts in at about 26 minutes.) There’s also a community site (in English, fortunately). And, the makers of ComiPo! have set up an English language Facebook page where Facebook users have helpfully posted their own English language tutorials on how to use the software. Sugoi ne!! Demo videos below the cut. 1 comment to Cool Find: ComiPo!